Late afternoon sunlight glows with warm tones of oranges and reds, especially in the fall and this beautiful fall day was no different. As we worked through several different poses, one of the things that was mentioned to me was the desire to have a image of my client with her senior ring. I wanted something simple, with a non-distracting background to really capture her and her ring. As we worked to find that perfect angle, she turned her back slightly to the sun and the warm glow became perfect. Exposing the image to keep this beautiful rim light (the light outlining her shoulders and hair), her face feel into almost complete darkness. Not a problem when have a flash to use! I positioned my flash and modifier to her right so that the light would drape across her body towards the strongest of the rim light without losing it. A couple of power adjustments to the flash and this is what a professional senior photographer delivers! 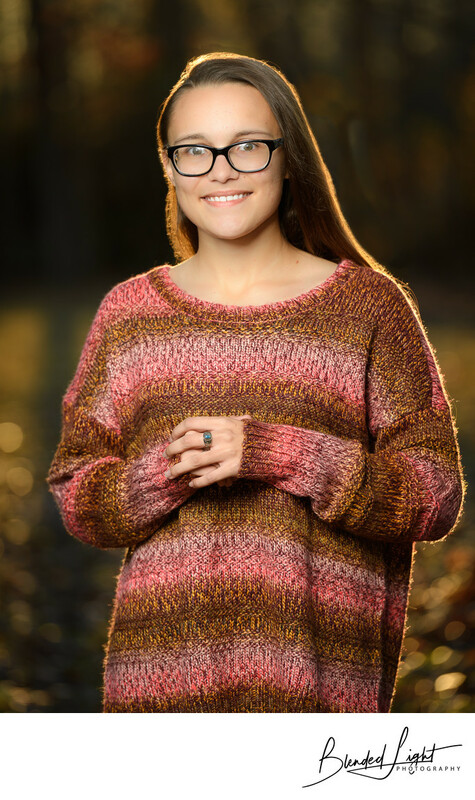 Senior photography is often looked at as simple, with most images created only using natural light. While that is fine, I chose to provide my clients with something more substantial and colorful, reflecting their personality and the excitement of the time in their life. I was honored to deliver a beautiful set of senior engagement images to his Johnston County, NC senior and am already looking forward to her cap and gown session in the spring! 1/160; f/4.0; ISO 100; 195.0 mm.